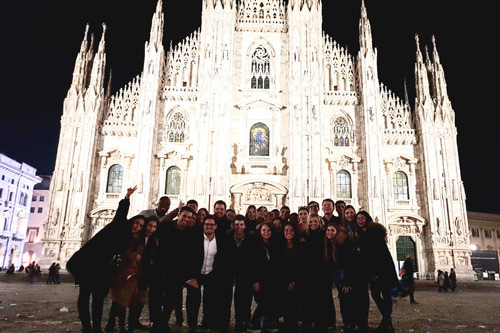 40 masters students from MSc Management travelled to Milan for their annual European seminar. The cohort of Cass students had the opportunity to experience the best of Milan’s industries in fashion, design and innovation. Under supervision of Professor Davide Ravasi and Dr Paolo Aversa, the group visited The Creative Academy - a postgraduate programme that gives 20 talented, young designers, the rare opportunity to transition directly from the classroom into one of the most prestigious luxury institutions worldwide, The Richemont Group. The group also visited Kartell, Campari and the Alfa Romeo museum and factory. The three day visit started with a lecture on the creation of luxury items by Alberto Cavalli in The Creative Academy. The trip to Milan was an amazing way of combining business related topics in a more informal environment. In Kartell there was a chance to see stunning examples of furniture and lighting, and admire how elegance and practicality works together. No design trip to Italy would be complete without exploring the influence of Italian car design and the history of the automobile industry. Students visited the Alfa Romeo factory and saw the iconic convertibles of the 1950's alongside Formula One supercars. The cohort also stopped by the Campari museum and factory, where in 1904, the company's first production plant was opened. Campari is now a highly successful and global business, with the Campari brand being distributed in over 190 countries. The trip to Milan was a great and memorable experience. It was a very insightful experience and I can only recommend other students to take the chance and participate in such trips.